PRIIPs is a new financial regulation which entered into force on 1 January 2018. It requires distributors to provide a KID (Key Information Document) to clients to help them make an informed investment decision. “PRIIPs is a new EU-wide regulation which seeks to enhance investor protection by providing full information about the investment product at the point of sale”. See the video which explains PRIIPs simply (click). PRIIPs is a new EU-wide regulation which seeks to enhance investor protection by providing full information about the investment product at the point of sale. This helps the investor to make an informed decision about the type of investment product he/she is investing in, what factors the returns are based on, the potential risks and maximum loss associated with the product and the fee structure. What has changed with PRIIPs? The new regulations require investment product manufacturers like life insurance companies such as OneLife to create key information documents (KIDs) for their products. These documents contain an outlined set of information, including a general description of the provider, an explanation of the main factors that the investment’s return depends upon, the level of risk associated with the product (classed from 1 to 7), an indication of the potential gains and losses and information on the costs over time. 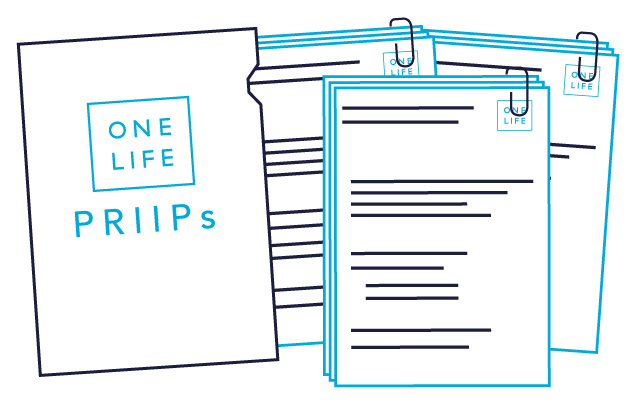 OneLife is committed to the PRIIPs financial regulation and works closely with its partners and clients to ensure that its obligations are fully met. Where do I go to find KIDs and related Investment Options documents? Please click here to visit the dedicated site which gives you access to all KIDs and related Investment Option Documents (IOD). It provides the information you need to make comparison against other products. You just need to select the relevant information to retrieve the PRIIPs documents available from OneLife. “OneLife is committed to the PRIIPs financial regulation and works closely with its partners and clients to ensure that its obligations are fully met”. If you cannot find your KID or in case of any enquiry, please do not hesitate to contact us .